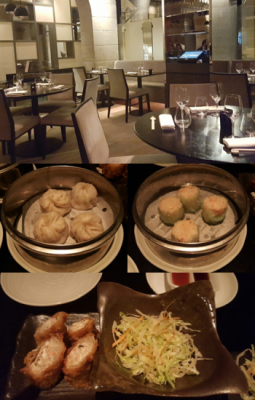 Located on Rue du Mont Thabor only one block from St Honoré street this contemporary Chinese restaurant serves gourmet creations mainly from the Cantonese gastronomy. The restaurants leans toward the trendy side with background music and the elegant and contemporary decoration in light grey and taupe tones. You have the possibility to pick from large selection of Dim Sum accompanied with a different sauce pairing each ravioli or fried one and starters. For the main course there is a large selection of meat and fish plus sides :Glazed pork sloin Cantonese dressing, Taokan beef filet. Short selection of dessert with the excellent ice cream from Hugo et Victor.